What on earth is going on in the Archdiocese of Vienna? Check out the video on Gloria TV, which I noted on Rorate. The video is in German, but the message is clear. A "Western" themed "Mass", which was if it was anything sacrilegious. This is going to make you angry. This was done with the "blessing of the Cardinal" Archbishop of Vienna, Card. Schoenborn. The ashtrays were an especially ghastly touch. The video shows two things: a) a picnic at which lots of people were eating, drinking beer, and smoking; and b) an outdoor Mass at the same location. If a) and b) were simultaneous, then yes, I am angry. But I can’t tell if they were: there seem to be a lot of camera cuts to make it seem as if they were, as if the cameraman wanted to arouse ire in the Catholic faithful. Just after college, I volunteered to teach in Catholic schools through a Notre Dame program called the Alliance for Catholic Education. On a couple occasions, the program staff took us teachers (all recent college grads) to Lake Michigan for an outing that featured both a) a Mass on the beach; and b) a beery picnic. The Masses and the picnics were always separate, and the Masses were reverent by NO standards. But you could have easily made a film that spliced clips of us at the Mass and then at the picnic which would have made it appear that we were drinking beer at Mass. Actually, I thought the remains of a sandwich apparently left on a table by someone on the way to Holy Communion — but let’s hope not — were a still more ghastly touch. But you gotta admit the camera work was simply superb in presenting this sacrilege so graphically. Actually, it occurs to me — as a graduate of a southern high school that until 2005 kept “Dixie” as its fight song and the hallowed flag as its banner — that the Confederate flag might have been the closest thing to a sacred image shown in this wretched video. Sacrilege is one of the great troubles of our time. It reminds me of part of my shtick at the end of wedding rehearsals: “So, as I set up for the wedding, I hope I don’t see anyone drinking outside the church, or, God forbid, on the portico or in the vestibule. If I do, I presume that everyone–in your intense devotion–has already assisted at Mass, because you are breaking the fast right before the wedding. So, since I presume that you already went to Mass, I adjust things so that the hour of beautiful nuptial Mass becomes a ten-minute ceremony.” This usually scares brides sufficiently that they yell at the men. Since doing this, I have been untroubled by the sacrilege of drinking in church during weddings, an issue that was one of my great shocks in the parish priesthood. I think Joe makes a good pt. Caution is necessary, but, oh boy, this does look terribly bad. The morning NO Mass I attended today was, by this standard, a model of reverence, even w. the young lady who was an altar server and distractingly pretty. I guess we shouldn’t make the perfect the enemy of the good, especially considering the video FR Z posted! I don’t know that I believe this clip either. Did you all notice the Confederate and US flags on either side closest to the stage? I believe it – I’ve witnessed Protestant outdoor Sunday services in Germany in such settings, with people smoking & eating sausage during the readings/preaching …before an “altar” w/ the candles/open Bible setting, only the music was much more dignified than what is shown here. As the liturgy in Germany/Austria becomes more protestantized, this does not surprise me, especially considering the liturgical abuse known to take place in this Archbishop’s Cathedral. I agree that there’s too much cutting and pasting to take this at face value. The relentless focus on the ashtrays suggests that it’s deliberate provocation. The old Battle Flag (or Naval Jack) was certainly featured prominently! Just color me suspicious that a picnic was intercut with a Mass. I’d prefer it if it were a case of a malicious cameraman skillfully cutting to make it seem as though the Mass was being so degraded. However, because of the long shots and pans I mentioned, it looks like the “Western Mass” was every bit as awful as the video shows. spared any audio. A small mercy. If all is as it appears, the best word I can find is appalling. It makes the issue of dancing clowns seem relatively minor. But then, the other thing that comes to mind is that an appreciable portion of the people in the world have taken leave of their senses. I wasn’t trying to be charitable, just accurate. The repeated use of clips, and the lingering focus on the ashtrays, just make me suspicious that this film was intended to make people mad. Fr. Z says that when people write to bishops or the Holy See, they should strip out emotion and just provide the facts. I wish the cameraman had done that here. The film shows that during the priest’s talk, there are picnic tables up close to him, but during the Mass there is a clear space of some distance in front of the altar. This suggests that the Mass and picnic were separate events. As to your specific points: a) I don’t know that the people standing up at 2:34 were doing so for the sign of peace; and b) if you made a film of Mass at my old parish church in Pittsburgh’s Little Italy, you would easily be able to pan from the priest at the altar to a couple guys standing at the front door smoking. The fact that this was an outside Mass (which I generally don’t like) doesn’t mean that the smokers were close to the sacral action or that they were taking communion. M. Heller’s point about priests going off the reservation without consent of their (arch)bishop is also well taken. While it was reported this event had the blessing of Card. Schoenborn, I have to wonder what, exactly, he was told about the plans. Have any objections been raised to the Cardinal’s office? The video has been pulled. dont know why it is so anathema, especially when accusations come from Catholic sites on the internet, to give somebody the benefit of the doubt, especially when the person being called out as guilty of sacrilege (pretty serious, to me at least) is not even at the event, save that it is (according to sources) in his archdiocese – hate to upset the fury but this nonsense happens at my archdiocese all the time, same for scores and scores of other dioceses. I hope somebody would defend me if I was ever accused of sacrilege by unknown people who put videos on the internet, espiecially when there is no evidence at all. As horrifying as this is, I think the food and drink are even more offensive than the smoking. Smoking was determined in response to some dubium in the 50s as not violating the fast at least (though chewing tobacco was determined to break the fast). Of course, doing either at Mass, along with eating and drinking is a terrible and sacrilegious undertaking. I find it very disrespectful even when children are given food at Mass. I think there was probably room at some church at the time nearby. I am confused. If the scene indeed occurred as the video shows, then people were eating full meals and then going to communion. How could the priest allow that? I admit, I was going on visuals only since I don’t understand German – other than “We Are the World’ by Michael Jackson!! But still, wouldn’t the priest require the fast? I am confused, truly. at the altar seen through the rising haze of cigarette smoke. The Mass and the dining/drinking/smoking happened together. in the video–if one is truly ‘country’, one uncovers when at church. Clinton, I think you’re mistaken. My guess is that there was an outdoor mass followed by a lunch during which the priest spoke. This would explain the grill smoke you see at 2:11 – they were getting ready for the lunch to follow. It would also explain why you see the priest speaking quite close to the people at some points (during the lunch), while the altar was some distance away from the people during the Mass. Some of the congregation appear to have broken the fast (woman with cup at 1:30) and others appear to be smoking when they shouldn’t be. But it really looks like a film editor has tried to make what this really was – an outdoor Mass followed by lunch – into something much more awful. [77.] The celebration of Holy Mass is not to be inserted in any way into the setting of a common meal, nor joined with this kind of banquet. Mass is not to be celebrated without grave necessity on a dinner table nor in a dining room or banquet hall, nor in a room where food is present, nor in a place where the participants during the celebration itself are seated at tables. If out of grave necessity Mass must be celebrated in the same place where eating will later take place, there is to be a clear interval of time between the conclusion of Mass and the beginning of the meal, and ordinary food is not to be set before the faithful during the celebration of Mass. Joe, your point is well taken. However, I agree with Clinton on the panning shots. Let us make acts of reparation. All of the letters from the CDW, reprimands, wrist slapping, etc., is not going to change these things. Some things require prayer and fasting. When parts of the world (including certain US dioceses) seem to reject all that has been offered by the Church about worship, then we must leave it to prayer and fasting. I got to the video just fine. Let’s turn this around. The eating and smoking were actually appropriate for the setting. The MASS was not appropriate. At a picnic, the priest can give a blessing, but why on earth celebrate Holy Mass in this environment? Why a Confederate battle flag at a “Western Mass”? Flags should not be props. That flag is filled with meaning, both good and bad. It was nice to see the women EMHC dress like deacons, too. It is the very zenith of what the modernist liturgists wanted: Mass is just a meal, anything goes, community celebration, nothing else. It is a vision of the destruction of everything sacred: the very opposite of Holy Mass. No apologies for saying again, “Can you imagine this chaos and abonination using the Old Rite?” If not, what does it say about the dangers of the new? Enough said. according to the reporter it was 6/27/10, the third annual celebration of this Mass at the longerstanding Vienna Country and Western festival. The C&W theme would explain the mishmash of costumes and props, including the teepee and stars & bars–anything that seems somehow iconic of the pre20th C USA. I just read the Rorate thread, where there’s discussion of the fact that this was supposed to be some sort of country/southern/western American festival. Is it possible they were simply trying to make it look as authentically American as possible, thinking in their utter (if hardly laughable) ignorance that they were reflecting the view of the liturgy that many Americans have? Of course, where they could have gotten such an absurd idea, who can say? Seeing something like this in Austria (Vienna, in particular)has me thinking..what about reknowned choirs, as well as children’s choirs (i. e. Vienna Choir Boys and the Vienna Philharmonic Orchestra)? Are they subjected to something like this, or are they protected and their Masses kept pure? The Mass took place June 27 at 10 am (Vienna time) on the final day of the “Danube Island Festival”, an open-air music event. “The traditional open air ‘COUNTRY GOSPEL MASS’ takes place at 10 AM. They show that, as the video describes, the area near the altar was occupied by participants in chairs; picnic tables for the majority of the crowd were behind the first group. While the video goes out of its way to emphasize distasteful images of people smoking, the basic facts described in it look consistent with the photos linked above. Amongst my many activities, I am a Civil War reenactor. At some events, we are blessed with the presence of a priest who has said Mass for us. 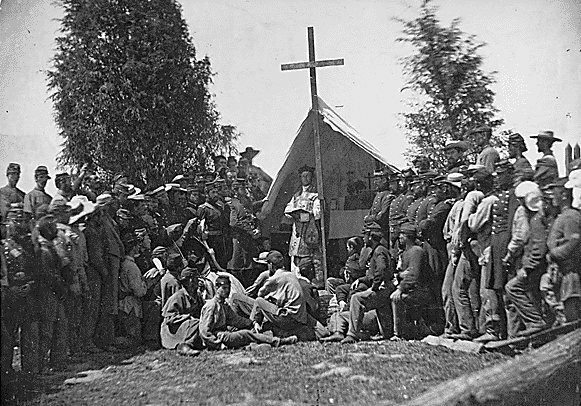 There is a well known picture of the Fighting 69th New York celebrating Mass in the field in 1861. We use this picture and other accounts for out model. Mass is celebrated in a field with a portable altar. Mass is in the OF, in English, though we are working on our Latin to have an EF some day. Our Masses have always been reverent. No one would have dared smoke, much less have a plate of food. FYI, no national flags of any sort were present at our Mass – and especially not a nylon Confederate Naval Jack. Joshua08’s cite to Redemptionis Sacramenum is very helpful. Even if my “charitable” take on events is correct, this sort of thing (outdoor Mass in picnic setting ripe for abuse) should not occur. Well anyone who has ever been to Europe knows that people smoke everywhere there. And the US companies push and advertise it there like no where else. But more offensive to me is the eating. Is there no fast before communion at all anymore?? Can you really eat and then go up and receive? And what is up with the Confederate flag of the Southern States, many, many people see that as downright offensive. It just is a great video to show Rome people are going to do it “their way” just like the burger. If Cardinals continue to sanction this stuff then I really am not surprised the Church is empty, while the fields of Austria are full. Why couldn’t this simply be a Christian rally or picnic after Mass? Or would those same people dare not give up one extra minute of their time? I guess this is the photo you’re thinking of? I think the problem is that, bless their hearts, the folks in Wien have no idea how to do authentic re-enactment. They don’t have any better concept of “western” than a bunch of folks in North Georgia have of Oktoberfest . . . but both sets of people try, with pretty silly results. We shoot Cowboy Action, and (with a few exceptions) everybody tries to be as authentic as possible. But since it’s not a military unit we can’t enforce uniformity as you can in a WBTS re-enactment group. I’ve made a point of researching every detail of my outfit and making everything by hand out of the correct materials. It’s great that you have a priest who’s willing to celebrate a field Mass for you. I’m exploring the possibility of getting one of our Parochial Vicars as a chaplain, he’s ex-military and a shooting sports fan . . . but since the vast majority of our members are Methodist or Southern Baptist that is probably not going to fly! Cardinal Schoenborn has gone batty of late, methinks. He is an ardent proponent of the Medjugorje Cult where the “Gospa” has spent (her/his? what do you call a demon?) spleen in 40,000+ messages rambling on about such things as a bloody handkerchief leading to doom, but, interestingly, and like those in the video, one of the “visionaries” at Medjugorje, Ivan, likes to take smoke breaks during mass! I know our good Pope Benedict XVI has a soft voice, but I hope he wields a big stick for once (since JPII was too “kind-hearted” to do it, but sometimes the kindest heart can wield the heaviest stick) because the faithful are really suffering under these things right now. us why such norms are in place. Would that they were observed by all. Dear Jerry, I have no doubt that he had no doubts about the event, he loves baloon masses for instance; he even seems to want to catch some of them! He likes applause, too, like a star! But where, o’ where is Christ? Ah well, it’s a party, so who cares! As mwa correctly notes, all baptised Christians were invited to receive Holy Communion. This is appalling, and I find it hard to believe that Cardinal Schoenborn would allow this!! I wasn’t surprised to see the casual nature of the Mass or the eating & drinking, though. Having attended large outdoor Masses (such as at World Youth Day), I remember seeing people eating during the Mass. So sad. Kyrie eleison. If every baptized Christian was invited to communion, that is terrible. I’d like to report that I was once at an outdoor “mariachi mass” (bad idea…) in Spanish at a Hispanic festival, at which there was no food or drink or smoking. And as a long-time reenactor, I attended three different masses in a barn. Lots of people in medieval costumes attempting Gregorian chant without any training, but no eating, drinking, or other irreverence. I think it’s nice to have mass for people when they are at big outdoor events and would find it hard to leave to find a church. This doesn’t look like the best example of one, though. This is the most bizarre “mass” I have ever seen. I am doubting it was even valid. Hopefully the holy father will crack whip. Most festivals, reenactments, etc. either schedule Mass or other services before events start happening (allowing people who work the festival to attend), or hold them in some area separated clearly from other goings on (in a barn, out in a field, in a special tent). Or both. (Sometimes it’s very hard to find Mass, thanks to this separation.) Most of the time, even the most clueless or unbelieving people at festivals are very willing to be respectful onlookers or respectful participants in Mass. There is something about public festivals that makes people docile to customs and expectations, if they are clearly laid out. This seems to be a case of Very Bad Logistics. The Mass is being held at some midpoint of the festival (in the evening, perhaps) and in the center of the stage area, with booths for concessions already open. There’s not a clear enough separation of events, so people lounging at the picnic tables with food (and the person shooting the video) aren’t totally clear that they aren’t participants in Mass. So I don’t think this was malice or dissidence. I think it was sheer cluster-idiocy, of a sort known to those of us who’ve helped out with event-planning. This priest who celebrated this mass was not just any priest. It was the vicar of the St.Stephen’s Cathedral ( seat of his Excellency the cardinal Schoenborn). This mass was the third annual event. One of the comments particularly appropiate. Lord forgive them, for the know exactly what they are doing. The whole thing was already last year on Gloria TV. And as usual, nothing will happen. The wolves in sheep clothing are roaming the world. The very fact that this COULD be a licit OF Mass tells us something about what we have come to accept as a normal part of the OF. You couldn’t make the claim that these were shots of an EF or Eastern Rite liturgy spliced together with the picnic that came later. It just wouldn’t work. The Mass footage would be very different from the picnic footage, even if the Mass had been celebrated outdoors, in the same spot where the later picnic took place. This really does need to be brought into the public forum; just years ago, this was taboo territory in the Vatican, and now, seemingly the the Pope’s approbition, since this was published by a Prelate close to the Pope, it is ready for serious, theological, debate. The members of the Church deserve this discussion! I’ve been to “Die Heiligen Messe” in Germany at a few fests (Bad Durkheim, Bad Kreuznach, Bernkastel-Kues, Speyer, Mainz, Munich, etc…) and they were NOTHING like this, not at all. It was bad form for the “invitation to Communion.” The priest ought to have reminded folks about the rules for receiving communion. One responder above noted the abuses at World Youth Day, so I thought I would relate a story. When I was in Paris for the outdoor Mass, people in our vicinity were sitting around drinking beer, eating and playing cards (yes, during the Mass)–when suddenly the distinct odor of marijuana smoke wafted by. A woman from a French group next to us leaned over and exclaimed cynically (as only the French can) “C’est l’Esprit Saint!” I don’t think I will ever forget it. IMO the Pope sets a very poor example in this regard by promoting or at least going along with these large outdoor Masses–they lead to abuses on an overwhelming scale and spread the idea elsewhere. I speak German and I have no doubt that everything was just as bad as portrayed. The printed text shown towards the end says “all baptized may receive Communion” and the priset said all who “feel” they want to receive Comunnion are welcome to. How much worse could it get even without the Picknick? Sorry, the PRIEST said, of cousre, and COMMUNION! Well, since they invited all the baptized to receive Communion, then I think we can conclude that they really were trying to be “friendly” and “open” with their bad logistics. So yeah, there was dissidence. A lot more idiocy, though, because it’s still badly arranged even for that. A better video to see at gloria.tv: http://www.gloria.tv/?media=30596. :-) TLM Mass in Hungary from 2009 (aired via one of the National TV stations) with some good Gregorian inspired chant. The celebrant is Fr. Balázs Barsi OFM. Location: Chapel of Blessed John Henry Newman, Sümegcsehi, Hungary. This really isn’t surprising at all. I have seen things like this here. I recall a certain beach mass, complete with bishop presiding, to commemorate an anniversary of the founding of this diocese. I was astonished that such an august occasion would warrant a “beach mass,” but this was the nineties were talking here, and the reform of the reform has been slow in coming here. There were people, catholic & non-catholic, wandering about. There were swimsuits and there were refreshments and cigarettes among other things…and lots of talking….simply because the outer boundaries of such things are porous and people wander in & people wander out. Not to mention dogs. We have a new bishop, and I fervently hope that such things are past in this diocese. We shall see. PS, I’ve seen picnic table masses, coffee table masses and on one occasion a dresser-top mass–in the middle of Rome, yet, when a priest wanted to say mass for a tour group I was a member of (unfortunately) and didn’t plan things well enough. I have gone back to Rome on my own since and now I stay away from tours. This kind of stuff happens, sometimes without much warning in tour groups. I’m with Suburbanbanshee on this one. This is a Mass in the middle (temporally and physically) of an outdoor festival. There is no evidence that the people eating, drinking and smoking are attending the Mass; they’re attending the festival, doing normal festival things, and the Mass happens near them. Indeed in the video there seem to be two groups, the congregation sat on benches in lines in front of the priest, and the non-congregation festival goers sat around the tables eating and drinking. The problem is that the two groups are next to each other, with no real distinction between them, so I think this is part of a broader problem of a loss of the concept of sacred space. Certainly having the Mass outdoors makes this problem worse. Recently here we discussed the problems of outdoor Masses, and I think a lot of them (such as concelebration by many priests who cannot even see the altar) come from this lack of definition of the sacred space. (Yes, there are other problems as well in the video, including the offer of Communion to those who are not in communion with the Church, but those are problems that can be found in many parish churches, not just open air Masses). Oh, and I think that singing Country, even outside a Mass, should be a capital offence unless you are within sight of the Appalachians. To reply to RichardT, I speak German, and there IS evidence that the people at the “Bier-Tische” (beer tables) — at least some of them — were attending this “Mass”. As an example, the video shows how a woman’s husband brings over her food, and she stands up when the priest says: “Let us pray”. Furthermore, you can see how the people at the tables exchange the Sign of Peace by shaking each other’s hands. Besides distributing Holy Communion in two places near the altar, the Priest announces that Holy Communion will be distributed in two places in the back. You don’t see any tables in the first rows because the organizers, among others, were sitting there in their costumes. I’m not surprised by such a spectacle — perhaps the organizers thought they could reach out to more Catholics by having Mass at a big music festival instead of expecting Catholics to come to Church. But their methods are severely misguided. This is also the 3rd time this “Western Mass” has been held, and Gloria TV has documented the liturgical abuses of these past “Western Masses”.